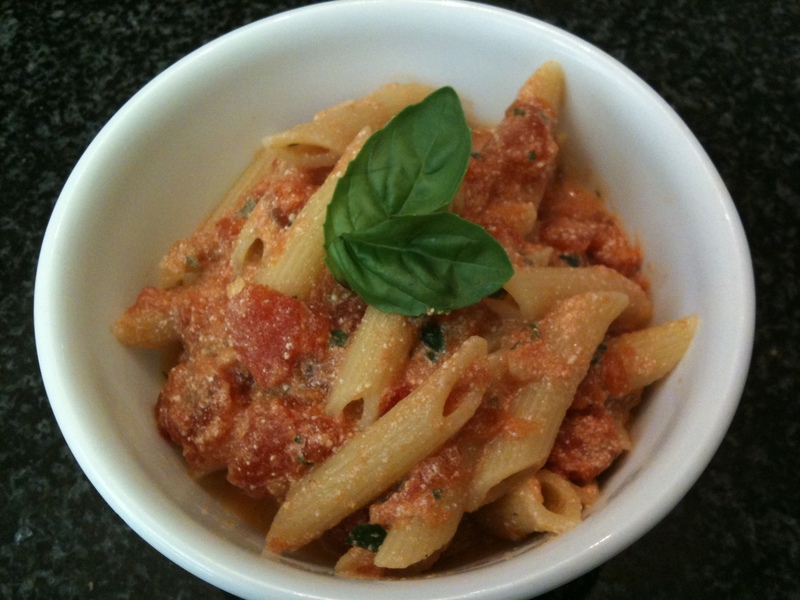 This pasta sauce uses a short list of ingredients and is very easy to make. This recipe is for a vegetarian pasta dish, but you could always add meat if preferred. The key ingredient that makes a world of difference to this otherwise simple tomato sauce is ricotta cheese. Try adding a dollop of ricotta cheese to your favourite tomato-based pasta sauce recipe, or simply mix it in with store-bought tomato sauce. This is a great way to use up leftover ricotta. Some of my other recipes that use ricotta cheese include lasagna rolls, ricotta and tomato crostini, wild mushroom ravioli, puff pastry tarts with arugula and cherry tomatoes, and lemon ricotta muffins. Note: Sometimes, I like to add 1 small onion, finely chopped. I cook that first in the pan with hot olive oil, stirring frequently, until soft, translucent, and just starting to brown, before adding the garlic. But the sauce is already delicious without the onion. Note: Since the flavours in this recipe are so simple, it is very important to use high quality ingredients. Heat a large, heavy bottomed sauce pot or dutch oven over medium heat. Add a few light drizzles of olive oil. Once the oil is hot, add the garlic and stir until lightly browned and fragrant. Then add the cans of tomatoes with juice. Increase the heat to high, cover the pot with its lid and bring the tomatoes to a boil. Reduce the heat to medium low, remove the pot lid, and allow to simmer until reduced to the desired consistency, about 30 minutes. Keep in mind that the sauce will continue to thicken as it cools and especially after the ricotta cheese has been added. You want to time things so that your tomato sauce is done at the same time as the pasta. So, while your tomato sauce is simmering, bring a large pot of water to a rolling boil over high heat. Add a generous pinch of salt to the boiling water and add the dried pasta. Cover the pot with its lid and bring the water back up to a full boil. Remove the lid and reduce the heat slightly to maintain a strong boil. Cook the pasta until al dente or other preferred doneness (I like my pasta to be softer than al dente but still slightly chewy). See the package instructions for cooking time guidelines. Strain the pasta well and transfer it to a large, heat safe bowl. When the tomato sauce has reached the desired consistency, add salt and pepper to taste, but keep in mind that the ricotta cheese has added salt as well. If desired, add the fresh cherry or grape tomatoes and bring the tomato sauce back up to a near boil over medium high heat while stirring constantly. Stir in the basil and parsley. Then remove the pot from heat and stir in the ricotta cheese until thoroughly combined. Working quickly, toss the tomato sauce with the drained pasta in the large, heat safe bowl. Dish out the pasta into individual serving bowls or plates, garnish with fresh parsley or basil if desired, and serve immediately. This dish tastes best when it is still piping hot. My name is Emilie and I have read your blog and I really liked your recipes! I work for a website called myTaste.com and I would love for you to join us! http://www.mytaste.com is a search engine that collects food blogs. We already have over 4000 blogs and if you join us you will take benefit from the traffic that we are sending to your blog. Thanks Emilie! I’ve joined, now.